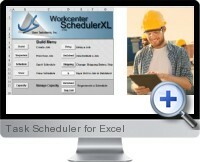 Task Scheduler for Excel is a low cost and easy-to-use spreadsheet templates for project management, scheduling customer jobs and employees, generating calendars and Gantt charts. This collection can be used as a set of building blocks to develop custom applications. The simple Excel based programs provide an easy to use set of tools to help any organization manage projects more efficiently, improve customer deliveries, and minimize work in process times. Computation of lateness and other performance measures. Scheduling of work according to precedence relationships.